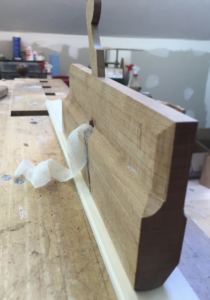 There are many reasons to introduce moulding planes into your shop. The type of planes you choose may vary just like the reasons. Some will choose hollows and rounds over dedicated planes. Some will choose antiques versus new. 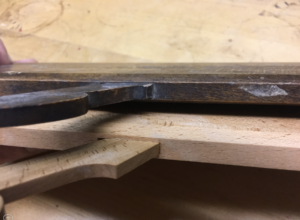 In this post I will address the antique group by showing exactly what I sell other than a very good looking tool. The first thing that a plane’s performance depends upon is the fit of the wedge. 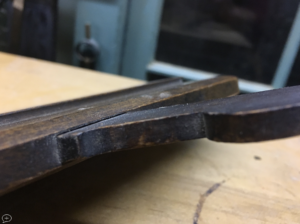 An antique plane with a poorly fitting wedge is to be avoided. 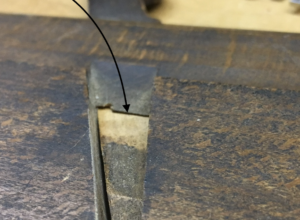 Fixing the wedge of an antique plane can mean making a new wedge, which means needing to re-bed the iron. 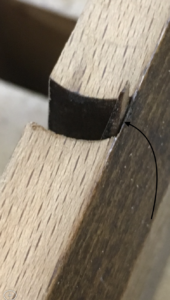 Fixing the mortise will lead to tweaking the mortise, making a new wedge and re-bedding the iron. 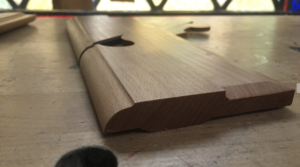 Essentially, a poorly fitting wedge means going through the process of making 30-40% of a new plane. 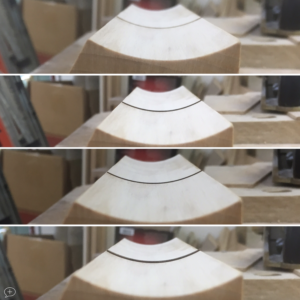 What is a poorly fitting wedge? 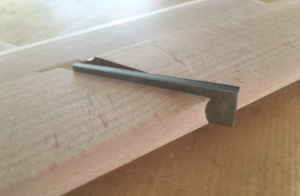 If a wedge can be manipulated inside of the mortise then the wedge and mortise are improperly fit. There can be no slop. A wedge that moves is unable to uniformly seat an iron because the wedge will not sit uniformly from one instance to the next. Let’s look at how my wedges fit. There is no shadow at the bottom of my ramp. 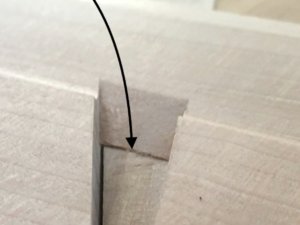 There are no visible gaps at the top of the mortise. If you try to manipulate the wedge in either direction you are not able. The wedge fits ideally here, but that is not all. This wedge has a slight gap. 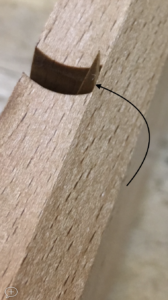 As a result, the wedge may be manipulated inside of the mortise, which, again, means that the wedge may not sit in the mortise the same way on all occasions. The iron may be bedded in some instances and not in others, depending upon the lateral position of the wedge. When looking at the two side-by-side you may see the difference. The fit on the port side is currently equal. The starboard? Not so much. There is a shadow at the bottom of the ramp here. What does that mean? While there is no shadow between the ramp and the wedge of my plane (above), there is also no shadow or space between the wedge’s tip and the body. No matter how I try to force the wedge, I cannot create a void here. 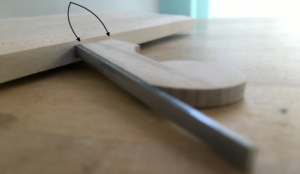 There is no room for play between the wedge and body of the plane. This means that there is no possible void in which the shavings may be trapped. There is a void between the wedge and the blind side of the body in the antique here. This means that there is a void in which the shaving will be caught. 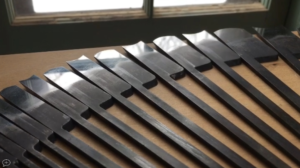 A plane’s performance depends upon a properly fitting wedge. 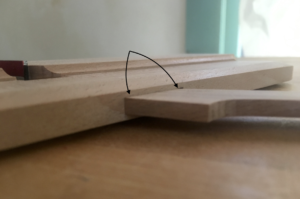 My new planes come with a properly fitting wedge. In addition to the fit of the wedge, the mating surface between the iron’s back and plane’s bed is extremely important. A plane with an improperly bedded iron will chatter, clog, and dig into a surface rendering the plane unable to take a fine shaving. This is best pictured with an iron has not yet been shaped. Antique planes will vary. Re-bedding an antique iron is generally a straight forward process if it is not off by much. However, you will likely recognize that an iron needs to be bedded after you’ve profiled and sharpened the iron. Re-bedding the iron at this point will mean re-sharpening/profiling the edge. This brings us to sharpening. My irons come sharp. The way I use them is the way you will get them. Additionally, my irons match the profile of my soles. This means that you can take a fine, full-width shaving. 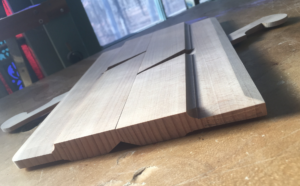 Antique planes will have a high spot behind the mouth, conservatively, 100% of the time. The severity of that high spot will vary, but it is there. Know that a plane can only take a shaving as fine as the sole is flat. My soles are flat along the length. Finally, my soles match each other. This allows easy seasonal maintenance, among other advantages. 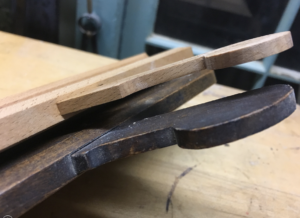 I sell planes that work correctly and are, in the parlance of our industry, “ready to go.” They have wedges that fit appropriately, irons that are bedded properly, cutting edges that are sharp and match flat soles, and soles that match each other. There are other advantages to new versus old, but those are better demonstrated than pictured.